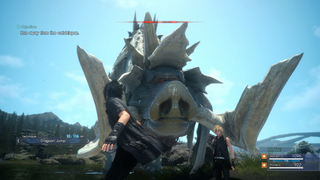 This morning, Square Enix released a 3.4 GB patch for Episode Duscae, the demo for Final Fantasy XV. Yes, you read that right. A 3.4 GB patch. For a demo. In addition to a new boss-ish monster, the patch will add more character interactions, more warp points, and a dodge roll for Noctis. Apparently there are framerate improvements and new sidequests, too. Given that this is the only new Final Fantasy XV stuff we’ll see for at least two more months—they say they’re skipping E3 and will kick off a new marketing campaign at Gamescom in August—this seems like a good opportunity to do some live-streaming. So live-stream we shall. I’m going in blind to the new content, so enjoy watching me die a lot. I’ll be streaming for the next hour or so starting at 12pm-ish ET.